In order to best prepare our students for the future that God has planned for each of them, our STEM (science, technology, engineering, and math) program is integrated into all levels of academics. From Pre-K to High School, STEM (Science, Technology, Engineering, and Math) inspires our students to love learning through real world, problem-based lessons and activities. By focusing on relevant connections to the curriculum, students understand how the topics they are covering in all content areas can be applied to their everyday lives. 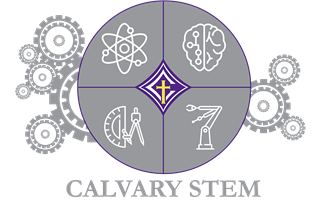 At Calvary, STEM is not just a subject, but a culture, which extends into all aspects of learning for our students. Calvary’s STEM program reinforces communication, collaboration, creativity, and critical thinking with challenging and fun lessons. As our Cavaliers transition from elementary to middle to high, our STEM program is designed to move with them into higher levels of inquiry, investigation, and innovation. Lower School classes, PreK-4 through 5th grade meet two times a month in the STEM Lab to participate in a hands-on, problem based, STEM lesson related to a content area they are currently studying in class. Teachers facilitate while students are given the opportunity to make relevant connections working collaboratively with classmates in pairs or small groups. Each STEM BREAK is designed to challenge the students beyond the traditional classroom setting while sparking passion and confidence in learning. The integration between classroom lessons and each STEM challenge creates authentic connections and develops a deeper learning for the students. This lesson can be used to continue the content or as an introduction to what the first grade studies with apples and as a tie in to the start of autumn. In this experiment, students learn about "oxidizing" or the browning of apples. Students place small cut pieces of apples into clear jars of various solutions (water, lemon juice, tonic water, vinegar, and sprite) to watch as the apples change as exposed to the different liquids. This experiment also covers the scientific process with all 5 senses being used, as well as some additional vocabulary and math for set-up. Students read Dinosaurs Before Dark in class. In this STEM 2 part lesson, students will create “fossilized dinosaur rocks” as we discuss the process of fossilization and sediment layering. The second part of the activity will allow the kids to step into the role of paleontologists as they excavate their fossils! Each of the two sessions would take about 35 minutes. This is a simple coding activity using Legos to build sentences. Using colored Lego blocks and a key (algorithm), the kids will write their own sentences and then switch for another group to "decipher" their code. Teacher models a demo or two with them, then students start small by choosing their own creative sentence. Then, the students are given sentences to build that are more formal and "challenging." Teacher can even have the kids identify the parts of the sentence (diagramming) once they have uncoded the sentence. At the middle school level, Calvary students are immersed in activity, project, and problem-based styled curriculums integrating STEM into all content areas. Through formal curriculums such as Project Lead the Way (PLTW), FIRST Lego League, and Center for Education Integrating Science, Mathematics and Computing (CEISMC), our middle school students are taught the value of collaboration, critical thinking, communication, and creativity. STEM lessons relevant to various units of core classes are implemented throughout the school year to all middle school grades and subjects to supplement standards. 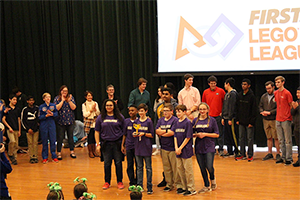 Our Calvary Middle School Robotics Team, The Lego ‘Liers, build, test, and program an autonomous EV3 robot to complete a set of challenges associated with the annual FIRST Lego League Theme. Lego Mindstorm EV3 Software is used to code the robot to accomplish fun missions at a competitive level. The 2018-2019 FIRST theme is INTO ORBIT. The Regional Competition in December is held at Savannah State University and results from the competition determine participation at the State level in the spring. High school students are offered a wide variety of opportunities to immerse themselves in STEM learning. Whether a student has previous experience in the Design and Innovation based learning promoted at the elementary and middle grade levels, or is just starting with STEM exposure, Calvary provides STEM integration throughout all high school curricula. Computer science embraces problem solving, hardware, algorithms, and perspectives that help people utilize computers to solve real-world problems in everyday life. The AP Computer Science A course introduces students to computer science with fundamental topics that include problem solving, design strategies and methodologies, organization of data (data structures), approaches to processing data (algorithms), analysis of potential solutions, and the ethical and social implications of computing. The course emphasizes both object-oriented and imperative problem solving and design in the Java programming language. These techniques represent proven approaches for development solutions that can scale up from small, simple problems to large, complex problems. Calvary’s Engineering Club is a place where students engage in real world, hands-on group projects designed to help them learn and apply the Engineering Design Process. Students will explore a variety of Engineering disciplines and learn the importance of leveraging each team member's strengths to complete a successful project. During the first semester, student groups will learn about hovercraft engineering and design and will construct a fully operational hovercraft model, similar to those in the Science Olympiad. Engineering opens the doors to innovation, to new discoveries, to advancements in technology. It engages our minds to think creatively and analytically. Calvary’s Introduction to Engineering course seeks to immerse students in an environment where they are challenged to combine their creative and analytical skills through project-based learning. The course utilizes Whitebox Learning, a web-based virtual modeling platform, where students will develop 3D models, learn how to analyze and optimize their designs, and ultimately construct and test them, all while applying the engineering design process and learning the science, technology, and math behind their designs. Some projects include a realistic scale CO2 powered dragster in which the body is constructed using a 3D printer, a balsa wood glider that students use traditional tools to construct and test, along with other projects like a water-powered rocket, and a balsa wood bridge. Calvary has partnered with Usher 412 Ministries to begin work on the development of an independent research group that will use environmental data collected from various sites around the state of Georgia in order to propose and secure legal, environmental protection.